Review of Native American Indian Culture. 2000 years ago, the Anasazi Indians inhabited the cliffs of the Southwest. They were the ancestors of the Pueblo Indians who live there today. There are 20 pueblo villages left; at one time there were 200! These ancient villages are built from adobe bricks. These natural homes are warm in winter and cool in summer; it rarely rains in the Southwest, so they won't melt. The Anasazi Indians left Petroglyph drawings on rocks and cliffs. Some were chiseled into the rock with animal antlers, some were etched with the acid juices from cactus plants. They are pictures of Indian symbols. Symbols are pictures drawn very simply of things in nature, such as animals, plants, stars, people, etc. The Indians were very spiritual people. They respected the earth, never wasted resources, and were ingenious at using the things in nature around them. 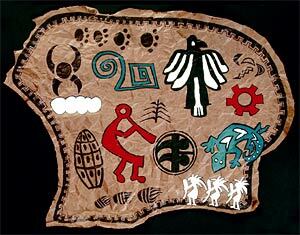 Art History  familiarization with Native American symbolism and the ancient art of petroglyphs. Each student is passed a piece of dark brown roll paper approximately 36" × 26". Crumble and unfold. Repeat to look like an aged animal hide. Tear an interesting shape around your hide, but be careful not to tear TOO much off. Take a minute to feed our brains with visual images of Indial symbols, looking through examples of symbols, and then drawing a variety of symbols on the large "hide" in white charcoal pencil. Stress creating an edge of border design. Names on back in white pencil. Review paint manners. No tapping on water bucket. To clean, swish, rub, dry, twirl on paper towel. CLEAN before each new color. Choose 3 colors. Paint some shapes each color. Think about painting a shape on either end and in the middle a same color. When your eye sees a color repeated in a path, the painting is more pleasing to look at. Don�t paint the border design. Be careful not to touch a wet shape. Go back into the designs and outline the painted designs with black marker. Outline the shapes you did not get a chance to paint. Do your border design in black marker. If you have extra time, create some new designs by just drawing them with marker in areas that are empty. Encarta Encyclopedia , Petroglyphs of Colorado, Arizona, New Mexico and Utah Field Guide.